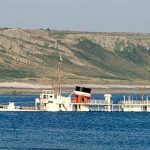 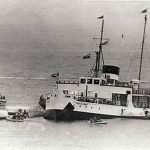 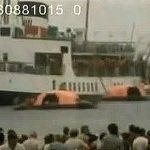 Today in Gosport’s Past:- on 3 August 1981, “Prince Ivanhoe”, the former Isle of Wight ferry “Shanklin”, managed to rip a 60ft gash in her hull on rocks near Port Eynon, on the Gower peninsula of South Wales, whilst on a cruise. 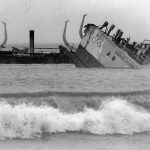 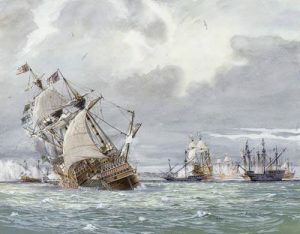 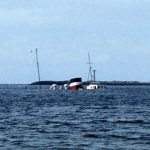 The ship was able to be beached in order to make evacuation easier, but was a complete loss as the tide rose. 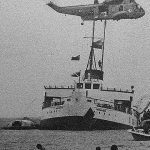 One man died of a heart attack during the rescue (by boats & helicopter), everyone else managed to escape unhurt, although maybe a bit wet. 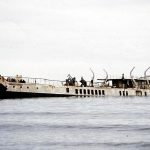 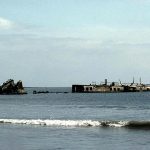 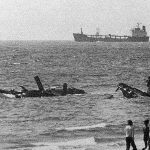 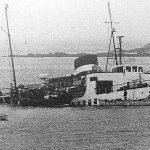 The sea took its toll over the next few weeks, and efforts were made to remove the wreck by explosions. 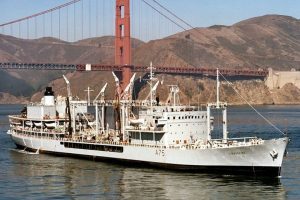 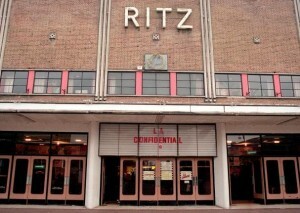 A sad end for a such a lovely ship, on which I’d (Dave Rowland) worked from 1973 to 1979. 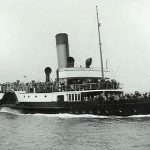 TSMV “Shanklin” was the third of three twin-screwed diesel ferries built by Denny Bros of Dumbarton, the others being the sisters “Brading” and “Southsea”, both launched on 11 March 1948 within 15 minutes of each other. 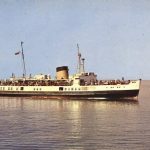 They’d been ordered by the Southern Railway, but since the railways became nationalised from 1 January 1948, it was British Railways who took delivery of the new ships; “Southsea” entered service on the Portsmouth-Ryde rout on 1 October 1948, “Brading” on 2 December. 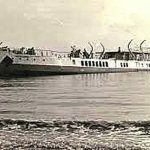 “Shanklin”, which differed slightly from the others, was launched on 22 February 1951, and commenced service with British Railways with an inaugural Solent cruise on Friday 15 June 1951, and beginning normal Portsmouth-Ryde service on Monday 18 June. 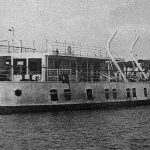 TSMV “Shanklin” had relaced the paddle steamer “Shanklin”, withdrawn from service on 30 October 1950, and subsequently sold to Cosens & Co of Weymouth, and renamed “Monarch”; she was put up for sale in 1960, and towed to Cobh, in Ireland, for breaking in March 1961. 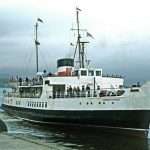 TSMV “Shanklin” recieved a couple of major refits, the last in 1974; I was in the crew that brought her back to Portsmouth from the graving dock in Immingham, arriving back in Portsmouth on 30 March 1974 after a journey of less than 24 hours. 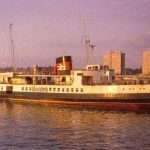 The mid-late 1970s saw some alterations to improve cruising conditions, but she was withdrawn from service at the end of the summer season in 1979. 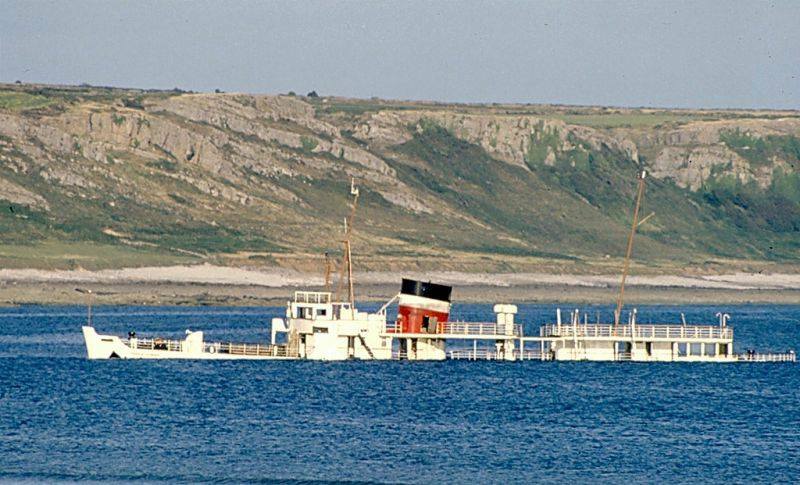 The Waverley Preservation Trust purchased “Shanklin” with the intention of keeping PS “Waverley” going with profits made from cruises on “Shanklin”, which had been renamed “Prince Ivanhoe”. 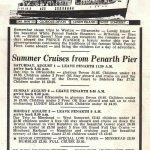 After a number of heavy repairs had been sorted out and the ship repainted etc, she began a programme of cruises in the Bristol Channel and the Firth of Forth from May 1981, to run through to September. 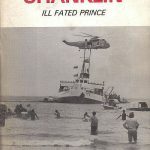 Sadly, “Prince Ivanhoe” didn’t survive the season….